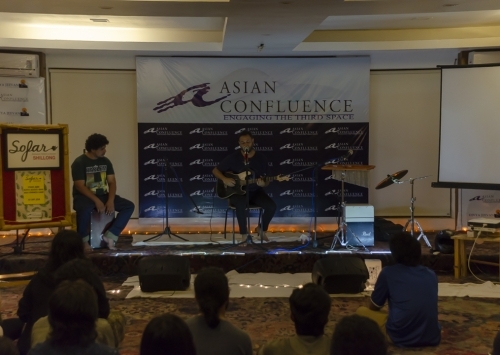 In collaboration with Sofar, Asian Confluence hosted a musical night with Indie artists Alex Matangi Kaan, Bottle Rockets India and Vishal Gore. The artists brought in an aura of soothing energy that matched the ambience of the venue. Travelling all the way from France, Alex is a sarod player who is in India for the past 1 year and trying to know more about Indian Classical music. He is a multi instrumentalist. His love for hills have brought him down to Shillong and his curiosity to know more about the northeastern state. Influenced by the nature and forests, Bottle Rockets India believe that nature together with music can heal the world. Vishal Gore is a Musician based out of Pune, India. Been a part of many musical ventures for over a decade and a half; he recently released his self-titled 5 track EP ‘Under A Lonesome tree’ which got nominated as ‘Editor’s Choice’ by Rolling Stone India!